Ameri-fans, we have sweet news. 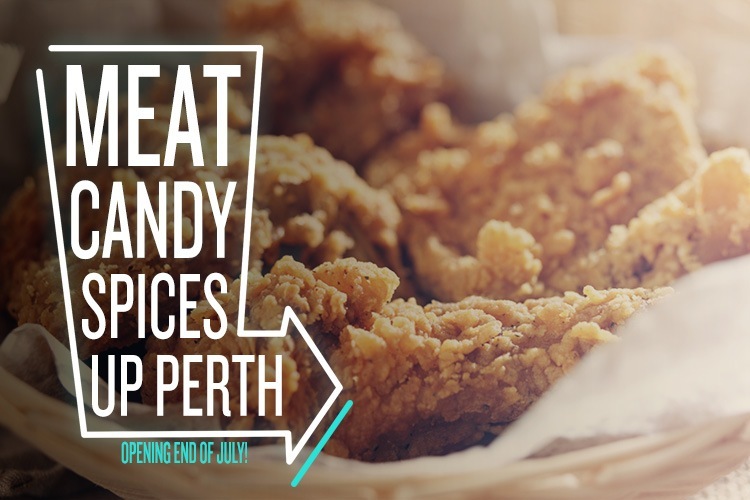 A new fried chicken shack called Meat Candy is expected to open in Northbridge at the end of July, and we’re already getting those fry-yay feels. Meat Candy is the work of Ben Atkinson, former chef at The Old Crow. Nobody does authentic American flavours like Ben, and this new eatery is going to bring a taste of the deep south all the way to Perth. The chicken will be cooked in true Tennessee tradition – soaked in buttermilk, dusted with chilli and fried until golden. It will be available in four flavours: southern, medium, hot and “you’re an idiot”, so you know it is going to seriously spice up your life. But if a juicy bird doesn’t ruffle your feathers, never fear. Meat Candy will also serve up a selection of American barbecue and charcoal-grilled items. From beef to pork, carnivores of Perth, you’d better get ready to meat your match! We had a chat to Ben to find out more about his new venture. Can you tell us a bit about your background and how you got started in the food business? Like a lot of cooks, I wasn’t great at school – I had a part time job at KFC which I really enjoyed, so when a work experience opportunity came up at the local tavern I jumped on it. I enjoyed the energy and atmosphere of the kitchen, and, only being 16 at the time, it really opened my eyes to a slightly different hospitality industry in the late 90s as opposed to now. I’ve worked my way through five-star hotels and good restaurants where I learnt the old-school discipline and technique. After finishing my apprenticeship, I headed overseas where I worked in places that bought the best quality produce and served it in the simplest ways. European produce was definitely an eye opener in how much quality and care was put into products. I guess now I have come full circle and will be happily frying chicken again. We’re definitely happy to hear you’ve gone back to roots! Meat Candy is going to be all about Nashville-style fried chicken. How does it differ from regular fried chicken and what makes it so delicious? There is a lot of Asian fried chicken joints around town where they use stickier and sweet style of chilli sauces to coat the chicken, which is really tasty, but I do find the batter/crumb on the chicken tends to go soggy. The style we do uses dried spice which is toasted with hot oil, and then we coat the chicken, which in turn leaves the chicken crispy with a coating of spice and the excess oil running off. The story behind Nashville hot chicken and how it came about is a great one, and unbelievably the place it all started back in the 1930s, Princes Chicken Shack, is still in operation. You’ll also have a selection of charcoal-grilled/smoked goodness on the menu. What can we expect? The chicken will be front and centre of the business, but we will incorporate smoke and wood grilling through the snacks and share plates that you can start with and also some of the sides. Ideally, we want the customer to make Meat Candy what they want, whether it’s hanging out for the night mixing it up with a few share plates, a chicken course and good booze, or a quick in-and-out tray of chicken before getting down in Northbridge… ether way we aim to provide good times. We’re feeling the good vibes already! The chicken flavours available will be ‘southern’, ‘medium’, ‘hot’ and ‘you’re an idiot’. Just how hot is ‘you’re an idiot’? The different levels are there so everyone can enjoy, and as for the “you’re an idiot” – it will be hot, but we are not going to be the kind of place where you’re going to see people’s pictures on a glory wall or “finish this and its free”. We will always be about using good product, made in-house where possible. We have been working on heat levels that will have different dimensions of heat and flavour, so at the end of the day, regardless of how hot it is you should still taste chicken at some point. Which menu item are you most excited about? Of course the chicken; the pressure fryer is the most expensive bit of kit in the kitchen. Frying chicken is something I do enjoy doing. Like most things, it requires a little bit of technique and needs to be consistent. Let’s be honest; good cooks are most concerned when cooking bird. Dry or under cooked = disaster… there are variables in it. What do you love about American flavours? By no means am I an expert in American cuisine. It’s something I researched a lot leading up to the opening of The Old Crow and travelled there with my wife many years ago. I think it’s more the soul of the cooking, the big punchy flavours with influences from north to south and the surrounding islands of The Americas. Like many different cuisines, it’s that Sunday comfort food that is shared around the dinner table that brings people together – rich or poor. And what a great way to bring people together! When you’re not chowing down on your own delicious food, where do you like to go for a fantastic meal? I haven’t been out to many of the newer restaurants around town lately. I have a two-year-old son who likes to make a lot of mess when he eats so we stick to the lower key outer suburb joints, and to be honest, they’re the places I like to eat at anyway. Meat Candy is set to open its doors at 465 William Street, Northbridge at the end of July!